The Clear Lake Arts Center’s capital campaign has surpassed its capital campaign goal with over $410,000 raised. “The Clear Lake Arts Center Arts Alive capital campaign is a community success story,” said Tom Lovell, campaign co-chair. “We are so grateful to all the donors and campaign volunteers for making this happen,” adding a special thanks to Steering Committee members Kathy Ingram, Jane Fogg and Paula Hanus. Surpassing the goal ensures that critical building repairs and enhancements can be completed in a timely manner. The $350,000 goal was set to accomplish the following: replace the original 40-year-old roof, repair interior and electrical damage from the roof leaks, relocate the handicap entrance to the Sukup Performing Arts Wing, electrical and painting updates, repair restrooms, provide additional storage space and begin the Sukup Lakeside Courtyard sculpture garden. Funds also will be used to start a Capital Reserve Fund, with a portion to go into an endowment. The Clear Lake Arts Center drew over 20,000 visitors last year from over 21 states and four countries, held over 500 events and served over 1,900 children with a lively, year-round Youth Arts Education program. The popular annual Art Sail has become an iconic Iowa tradition, which draws arts and residents from throughout the Midwest. 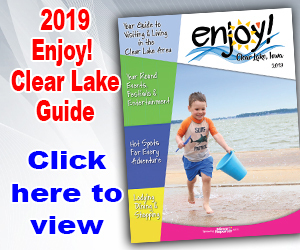 The Clear Lake Arts Center staff worked with the Clear Lake Parks and Recreation Department for summer recreation and with the schools for after school programming. Children’s programs are provided at below cost and scholarships also are available. Over 150 volunteers will log in over 7,000 hours of service to help make so many activities possible.